Suquamish, Washington, is a small Pacific Coast reservation town in the heart of the Port Madison Indian Reservation. At the start of every summer, tribal members from the Suquamish Nation transform the quiet seaside village into a volatile marketplace devoted to the sale of fireworks for the upcoming Fourth of July. Although most Americans celebrate July Fourth by simply watching fireworks displays, for many of the Suquamish the selling and setting off of huge displays of fireworks for Independence Day is a vital summer ritual. It is also big business and an important part of the local reservation economy. The main character in the film, Bennie Armstrong, Chairman of the Suquamish Tribal Council, has sold fireworks for three decades. For Armstrong and others, selling fireworks entails calculated risk and detailed planning. One first-time stand owner puts her house in the balance by using mortgage money to buy a stock of fireworks. A veteran seller has long depended on fireworks sales to make up the income shortfalls between salmon runs. Another couple uses income from their stand to start a Baptist Church on the reservation. 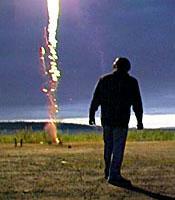 For Armstrong, the right to sell fireworks is symbolic of a larger political context in which tribes throughout the United States struggle to maintain their sovereignty. In his view, the sale of fireworks is a justly poetic blend of politics, economics, and independence. Nevertheless, the irony of celebrating Independence Day is not lost on Armstrong and other tribal members. But while some see the history of Indian-white relations as a litany of displacement, broken treaties, and cultural destruction, others see a story of Native deeds and contributions to the strength and development of the country as a whole. In reality, Armstrong and other Indians are dual citizens. As both American entrepreneurs and as Indians with an outlook unique to their experiences and traditions, they walk in two worlds. In a place where federal, state, and local policies routinely collide with Native sovereignty, “Boomtown” provides a multi-layered, subtle, and often-poignant portrait of contemporary Indian life, showing that Native tradition can meet today’s economic realities with unexpectedly successful results. “Boomtown” will motivate discussion in classes in Native American studies, American studies and history, cultural anthropology, and sociology. It was produced by Bryan Gunnar Cole. "A very good example of a documentary that celebrates and at the same time upholds a critical interpretation of our society. This is a work to be shown to all students." — Mary Ellen Davis, Prof. of Cinema, Concordia Univ.